It was another grand year for comic book fans. 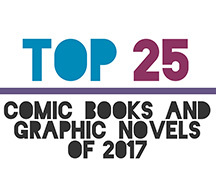 Whether your preference is superheroes, character studies, sci-fi adventures, or memoirs, 2017 offered a plethora of amazing books and series to choose from. Jeff Lemire again proved himself one of the top talents in the field with the ongoing crime fighter series Black Hammer, while young, relative newcomers like Tillie Walden (Spinning) and Chris Gooch (Bottled) defined themselves as talents to follow faithfully. I can’t believe you didn’t get to My Favorite Thing Is Monsters. Poignant and stunningly beautiful. Awesome playlist. I love to hear them as I move around the city on my electric 4x4. It is impressive how easy it is to move urban with electric vehicles Have you tried them? Today here we have came with one of the best games website which will help you to enjoy these browser games in the best quality and will also let you enjoy these games online without facing any problem. Get to know about diiferent types of comices through the post. For DUI leagl assistance contact our best Atlanta criminal defense lawyer.